What Is IASTM in Physical Therapy? If you have an injury or illness, you may benefit from physical therapy to help you move better and feel better. Your physical therapist (PT) will assess your condition and use various treatments and techniques as part of your rehab program. One such treatment is massage and myofascial release of tissues. There are various types of massage that PTs often use, and one such type is known as instrument-assisted soft tissue mobilization or IASTM. 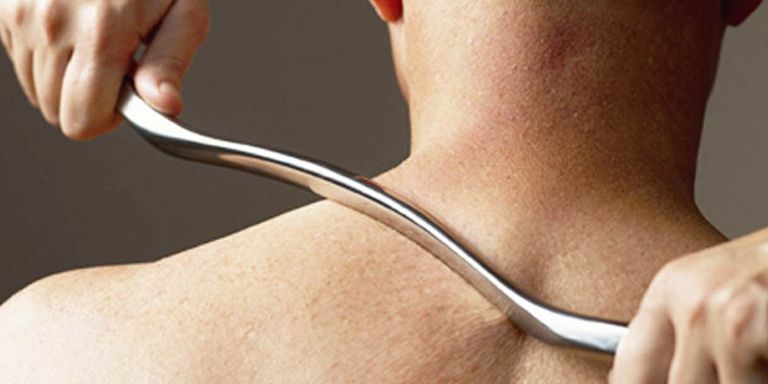 Instrument-assisted soft tissue mobilization, also known commonly as Graston technique®, is a specialized myofascial release and massage technique used during physical therapy treatments. It is a relatively newer treatment that involves using metal or plastic tools to improve soft tissue mobility in your body. These ergonomically shaped tools help your PT massage and mobilize your muscles, fascia (the collagen covering your muscles), and tendons. This is thought to reduce pain and improve movement. Sometimes after an injury, you may develop tissue tightness or restrictions in muscles and fascia. These soft tissue restrictions can limit your range of motion (ROM) and may cause pain. Your physical therapist may use various myofascial release and soft tissue mobilization techniques to free these restrictions to help you move better and feel better. Myofascial release with ISATM may be one way your PT treats these restrictions. It should be noted that there is some debate in the PT and rehab profession as to whether soft tissue restrictions really cause pain or can even be accurately identified by your PT. (If you cannot identify tight tissue, how can you possibly treat it?) Still, some PTs feel that they can find scar tissue and soft tissue restrictions and apply massage and myofascial techniques to help improve your motion and decrease your pain. And many patients confirm the benefits of myofascial release and massage as a treatment for their pain. The Graston technique® of IASTM was developed in the 1990s, purportedly by athletes, for athletes. Since then it has grown in popularity and is used by massage therapists, chiropractors, and physical therapists to help treat patients with myofascial restrictions that may cause pain and limit movement. IASTM is also used for other patients—not just athletes—with a variety of conditions. Physical therapists may use different types of tools to perform IASTM. Many of these look like medieval torture devices—blades, scrapers, and sharp, pointy things. Some of these tools are specifically designed by the Graston® company, and many other companies offer their own version of metal or plastic scraping and rubbing tools for IASTM. The goals of using these tools during IASTM remains consistent: to help free soft tissue and myofascial restrictions to improve the way you move. During standard massage techniques, your PT uses his or her hands to provide the treatment. There is typically direct skin-to-skin contact. During an IASTM treatment, your physical therapist uses a metal or plastic tool to provide the soft tissue massage and mobilization. This tool is gently (or vigorously) scraped and rubbed over your skin. The rubbing of the instrument is used to locate and release tightness in the fascial system, the collagen sausage casing-like covering around your muscles. When your PT uses an IASTM tool during your treatment, he or she will initially be searching for areas of fascial and muscle restrictions. These areas will feel crumbly or craggy as the tool passes over them. Once restrictions are found in the fascia, your PT can hone in on them, using the IASTM tool to scrape at them. So what is happening as your PT is using the IASTM tool to scrape at fascial restrictions? It is theorized that scrapping your tissues causes microtrauma to the affected tissues, thus re-initiation your body's natural inflammatory response. This causes a cascade of events to occur including reabsorption of excess scar tissue and fibrosis that is causing the restriction. Adhesions of scar tissue can then be appropriately stretched to help improve overall pain-free mobility. If you have any of these impairments, your PT may choose to use IASTM to help improve your condition. If you have any of these conditions, your PT may choose to use IASTM during treatment if warranted. During a PT session where IASTM is used, your PT will expose the body part to be worked on. He or she will then rub an ergonomically shaped metal tool over your skin. Your PT should start gently, exploring the area around your injury with the IASTM tool. During this time, you will likely feel gentle scraping sensations, and you may feel a slight gravelly sensation as the tool passes over tight areas of the fascia. Your PT may then focus in on an area that needs more work, and you may experience more vigorous scraping with the tool over your skin. During the session, you may feel some discomfort as the tool is passed over your skin. Be sure to tell your PT if you cannot tolerate the discomfort. Your therapist should stop performing IASTM if it is too uncomfortable or if you simply tell him to stop. After the treatment, your skin near the area that was work on will likely be red. In some cases, slight bruising may occur, especially if the IASTM treatment was performed vigorously. After an IASTM session, your therapist will likely have you perform active motions or stretches to improve your mobility. That can help keep scar tissue or fascia restrictions from reforming. While these benefits sound great, many have not been subjected to rigorous scientific study. Many studies about IASTM are case reports of one specific patient or studies done on non-human tendons and fascia. The results of such studies may not be relatable to your specific condition, so if your PT recommends IASTM, be sure to ask about the expected benefits. Whenever your PT applies any treatment to your body during rehab, you should question the efficacy of that treatment. Is the treatment provided supported by rigorous scientific research, and are there alternatives to treatments that may be more beneficial or safe for you to receive? If your PT believes that myofascial restrictions are part of the cause of your pain, injury, or movement dysfunction, he or she may use IASTM to help free these restrictions. Many PTs who use IASTM believe it to be an effective treatment for movement loss, pain, and myofascial restrictions. One recent meta-analysis compared the use of hands-on myofascial release to the use of instrument myofascial release, like IASTM, for chronic low back pain. The results of the analysis found little difference in the two techniques for reducing pain. The IASTM technique did provide greater improvements in disability when compared to hands-on myofascial techniques. Another systematic review in the journal Physical Therapy Reviews looked at 7 studies and compared IASTM to other techniques for musculoskeletal pain and dysfunction. The authors concluded that IASTM may have a positive effect on blood flow and tissue extensibility while reducing tissue viscosity and reducing the activity of pain receptors in tissue. Another study examined the use of IASTM, sham (fake) ultrasound, and spinal manipulation for patients with thoracic pain. One hundred and forty-three patients were randomized into three groups: IASTM, sham ultrasound, or spinal manipulation. Outcomes measures included pain level and a disability measure. The researchers found no significant difference in pain or disability with any treatment for thoracic pain; all groups improved over time and no significant negative events occurred. So IASTM is no more (or less) effective than spinal manipulation or fake ultrasound for thoracic pain. Do the results of any study mean that IASTM will or will not work well for you? Maybe, maybe not. But keep in mind that everyone is different, and your specific condition may respond in different ways to various treatments. The best course of action: understand what treatments your PT is using for your condition and have a reasonable expectation of the outcome of such treatments. And if you have any questions about IASTM—or any other treatment—ask your physical therapist. If you have pain or limited mobility, your PT may suspect muscle tightness, scar tissue, or myofascial restrictions to be part of the culprit. If so, your therapist may choose to use IASTM during your treatment to decrease tissue restrictions and to restore normal motion. This can help you quickly get back to your normal active lifestyle. Crothers, A. L., French, S. D., Hebert, J. J., & Walker, B. F. (2016). Spinal manipulative therapy, Graston technique® and placebo for non-specific thoracic spine pain: a randomised controlled trial.Chiropractic & manual therapies, 24(1), 16. Eid, K., Tafas, E., Mylonas, K., Angelopoulos, P., Tsepis, E., & Fousekis, K. (2017). Treatment of the trunk and lower extremities with Ergon® IASTM technique can increase hamstrings flexibility in amateur athletes: A randomized control study. Physical Therapy in Sport, 28, e12. Kim, J., Sung, D. J., & Lee, J. (2017). Therapeutic effectiveness of instrument-assisted soft tissue mobilization for soft tissue injury: mechanisms and practical application. Journal of exercise rehabilitation, 13(1), 12. Lambert, M., Hitchcock, R., Lavallee, K., Hayford, E., Morazzini, R., Wallace, A., ... & Cleland, J. (2017). The effects of instrument-assisted soft tissue mobilization compared to other interventions on pain and function: a systematic review. Physical Therapy Reviews, 22(1-2), 76-85. Williams, M. (2017). Comparing pain and disability outcomes of instrumental versus hands-on myofascial release in individuals with chronic low back pain: a meta-analysis(Doctoral dissertation, California State University, Fresno).